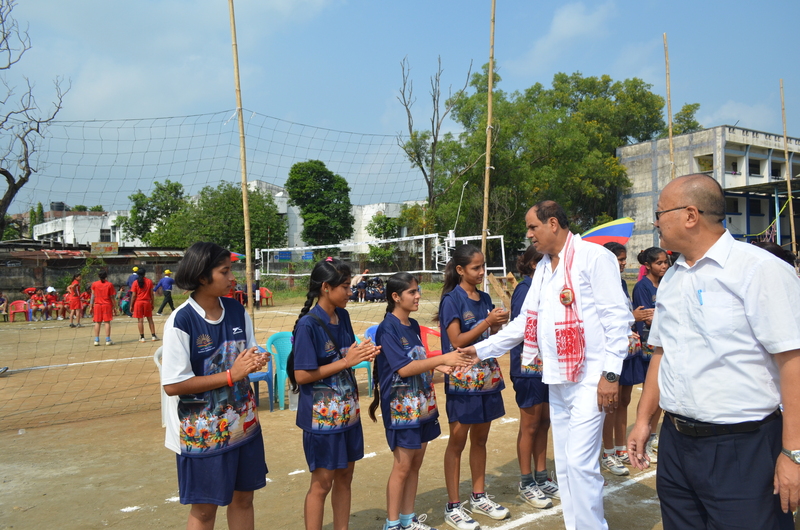 Sri.Ajit Singh, Honorable Excise,Sports and Youth Welfare Minister of State (Government of Assam) visited K.V.Khanapara today morning,which is the venue for 44th KVS National Sports meet (for Girls)2013,for the event Volley ball and enjoyed a quarter final match between Patna and Jammu Region.He was accompanied by Sri.K.J.Subba, Deputy Commissioner KVS Guwahati Region and other dignitaries. Mr.K.J.Subba, Deputy Commissioner KVSGR visit Kendriya Vidyalaya Narangi to see the arrangements along with Mr. S. Lakshmi Narayanan, Principal K.V.AFS Digaru & Officiating AC, KVS GR. Mr.K.J.Subba, Deputy Commissioner KVSGR visit Kendriya Vidyalaya IOC NOONMATI to see the arrangements along with Mr. S. Lakshmi Narayanan, Principal K.V.AFS Digaru & Officiating AC, KVS GR. Dr. Dinesh Kumar, Additional Commissioner (Acad) KVS visits K.V.NFR Maligaon on 18 October 2013 along with Mr.K.J.Subba, Deputy Commissioner KVSGR. Honourable Excise,Sports and Youth Welfare minister Of State (GovtOf Assam) Sri.Ajit Singh kindly Paid a visit to K.V.Khanapara today morning,which is the venue for 44th KVS National Sports meet (for Girls)2013,for the event Volley ball and enjoyed a quarter final match between Patna and Jammu Region.He was accompanied by Sri.K.J.Subba,Honourable Deputy Commissioner KVS Guwahati Region and some other dignitaries.